Answer: How do I tell where I want to go? Reading through the comments, it seems most people didn't have a hard time with Wednesday's Challenge. That's excellent! Sometimes Challenges should just be fun, a chance to practice finding something that doesn't take a million hours, but leads to something unexpected and interesting. 1. 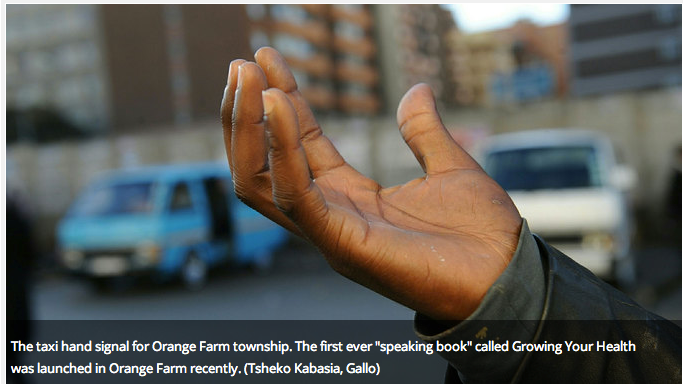 I want to take a taxi to Orange Farm. What special things do I have to do to hail a taxi there from JNB airport? 2. Can you find a statue that tells you how to get to the Central Business District using this unorthodox language? reveals that this is O. R. Tambo International Airport, the airport near the city of Johannesburg, South Africa. Ah. I know South Africa has 11 different major languages (Afrikaans, English, Zulu Language, Xhosa, Swati, Sotho, Tsonga, Tswana, Venda, Northern Sotho, Southern Ndebele), so I have to be prepared for a non-English search. But I'm going to start in EN, assuming that I'll have good luck here. Sure, enough, the first result is a YouTube video about the "Quirky Ways of Calling Taxis in Johannesburg." That video clued me into the idea that there was a hand-sign way to specify your destination. Interesting. is about a health on health topics, the image and its caption answer our question. Ah ha. The cupped palm is someone picking an orange. Got it. Now, how about that statue with a hand signal for the Central Business District? has a row of images in the first position, one of which is clearly a set of taxi hand signals. Clicking through to Images, then clicking through to visit the page takes us to an article in The City Fix about the recent installation of a hand signal statue at Vilakazi Street. Referring back to our very first hit (the PDF of all the hand signals), it's easy to see that the hand signal for the Central Business District is there. Marvelous! Otherwise, this Challenge was fairly straightforward. It was really just a matter of scanning the articles you find looking for key phrases (e.g., "hand signal") and then switching back and forth between regular web search and image search. Sometimes you'll find things in the most remarkable places. and discovered her most excellent TED talk on YouTube. If this topic is at all interesting to you, it's worth the 14 minutes to watch. 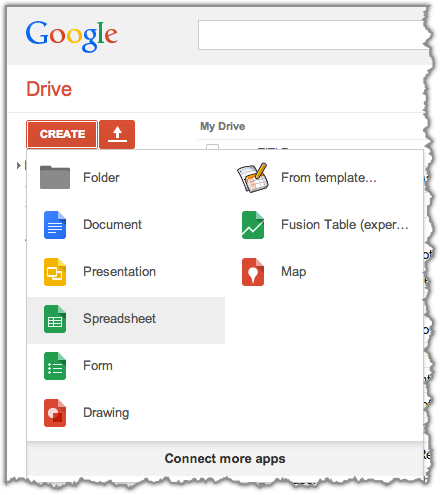 Wednesday search challenge (2/26/14): How do I tell where I want to go? Suppose I've just landed at JNB and I need to get somewhere in a hurry. I'd like to take a taxi, but it seems so complicated! It's almost as though you need to communicate in another language just to get around. Answer: How much did it cost to travel to Hawai'i in 1908? 1. How much would it cost to travel from San Francisco to Hawai'i? 2. About how long would it take to get from San Francisco to Honolulu? As most everyone figured out, the simplest way to find out the cost was to look in newspapers of the time for San Francisco. Unfortunately, the Google News Archive doesn't HAVE any newspapers from San Francisco, so you have to look around for that first. Advertisement in the San Francisco Call, 16 June 1908. From: CDNC. If you look around for a bit, you'll find there were multiple steamships travelling from San Francisco to Honolulu. This is an ad for the S.S. Mariposa. The S.S. Alameda also went to Hawaii. 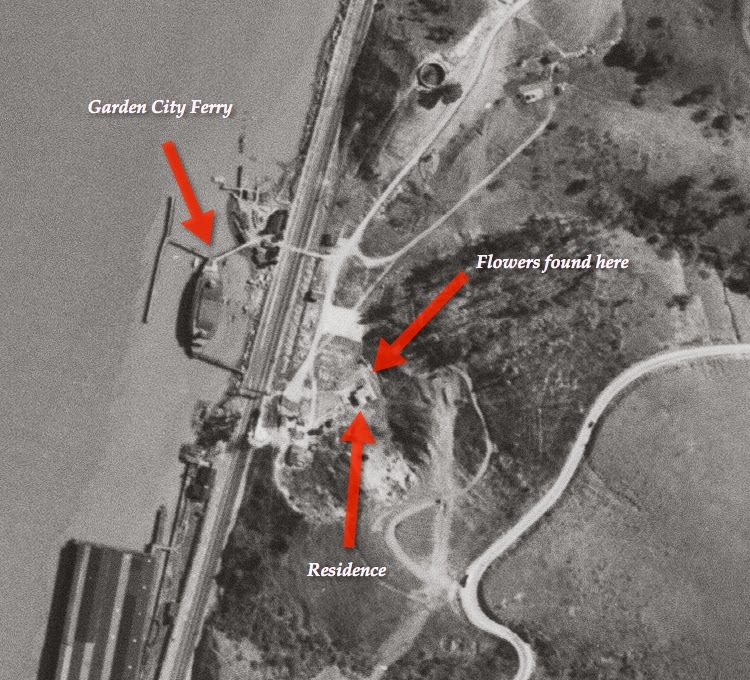 Here's a photo that Jon (the Unknown) found with a couple contemporary ships and images of the docks. you'll get a bunch of off-topic hits. But since this is a historical topic, I switched immediately to Books and did my search there where I found the United States Department of Education Bulletin, Issues 41-55 (covering the years 1903 - 1915). I chose this because it would give me average salary for a school-teacher in San Francisco during those years. If you look at the salary table on page 74, you'll see that the average salary was around $1,000. which led me to a wealth of books resources. (I found more tables of wages for different kinds of workers in 1908 than I could believe.) Although there was a fair amount of wage disparity, the average worker seemed to make between $400 - $600 / year. Schoolteachers seemed to be at the upper end of the income bracket. In any case, for most people, $110 or $125 is a big chunk of their annual income. This certainly was above the discretionary income for most people at the time. It was definitely something you'd save for over a number of years. "The trip from San Francisco to Honolulu is made 6 days by the steamers Mariposa and Alameda each of leaving San Francisco on the 1st and 15th of every month cabin passage $75 round trip $125 steerage $25 By sailing vessel the time may be 18 days and first cabin passage $40"
This book was published a few years before 1908, so the prices probably had risen by 1908 to the amounts quoted above. 1908 was quite a year. While looking for the answers, I also discovered that in 1908, "... Hawaiian Pineapple Growers' Association organized "to secure greater economy and improvement in the methods of cultivating, packing, transportation and marketing of pineapples and the products thereof." 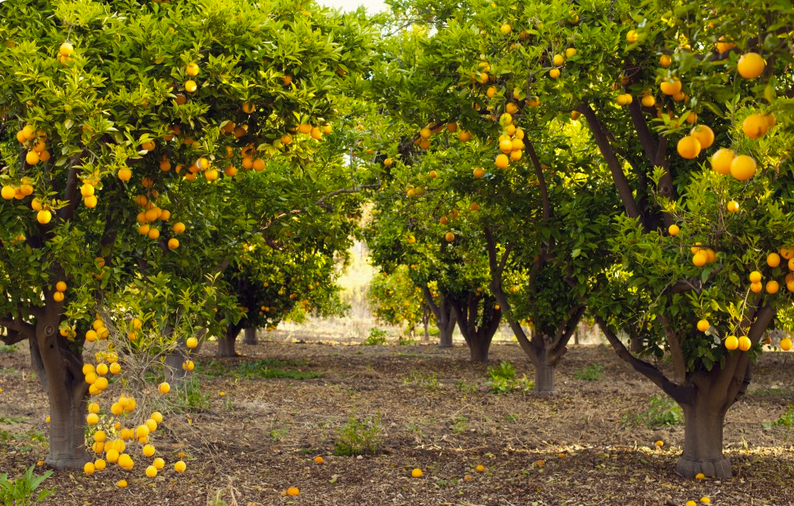 The Association begins a campaign to popularize use of the fruit." And so it began. With the Great White Fleet providing an impressive backdrop, the Hawaiian pineapple production starts to grow. But that's a story for another SearchResearch Challenge. Search lessons: As we've seen before, you sometimes have to be aware of the language that's being used (such as not "salary" but "wage"). This is especially true for changes in language over time. Once you find that first high-quality hit, pay attention the words and terms that are used. They will often be valuable in the next set of searches. And, when searching for historical context, don't forget to search in Books and newspaper archives. Even though Google News didn't have any SF papers, they're widely available. Don't get bogged down just because one resource doesn't have what you want. You can always search it out! Thanks for all of the comments, SearchResearchers. You do a spectacular job on these challenges. Keep it up! It's pretty clear that people are finding this week's Challenge not-all-that-hard. That's completely fine by me; we need a mix of both crazy-hard and simpler challenges. The question brought up a couple of interesting bits, and in tomorrow's answer, I'll try to weave all of these pieces together. When I write these Challenges, they're often (about 70% of the time) actual questions that people have asked me. Another 20% are questions that come up while I walk around or visit hither and yon. The last 10% are questions that are intended to illustrate how to use a particular search skill or information resource. But I always try to keep things interesting. (Be sure to let me know if a particular challenge just leaves you cold!) And, in general, I think we succeed. The world is full of fascinating things to uncover. And each week I try to bring you a Challenge that's both interesting AND teaches a little about SearchResearch. In the meantime, if you have a couple of spare moments, let me highly recommend an article I read earlier this week. How to uncover a scandal from your couch, by Brad Racino and Joe Yerardi, is a great case study in how to follow a line of evidence from initial stimulus (in this case, an unsealed FBI complaint) towards a set of insights. This is really investigative journalism at its web-search best. A remarkable story that SearchResearchers will appreciate. 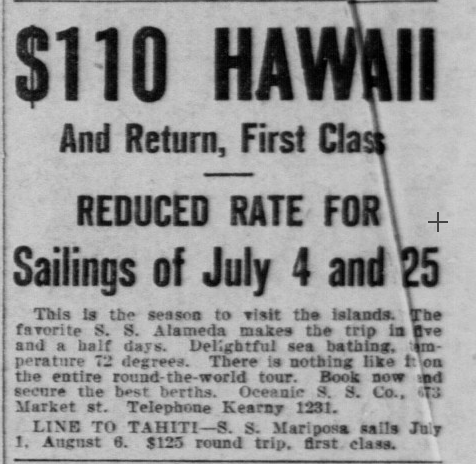 Wednesday search challenge (2/19/14): How much did it cost to travel to Hawai'i in 1908? When much of the US seems to be stuck in a deep freeze, one's thoughts naturally turn to Hawai'i. And when you think of Hawai'i, you think about traveling there. But at this moment, I happened to be reading a bit about President Theodore Roosevelt and his "Great White Fleet." As you know, the GWF was a cruise of several US Naval ships in a fairly transparent display of sea power worldwide. 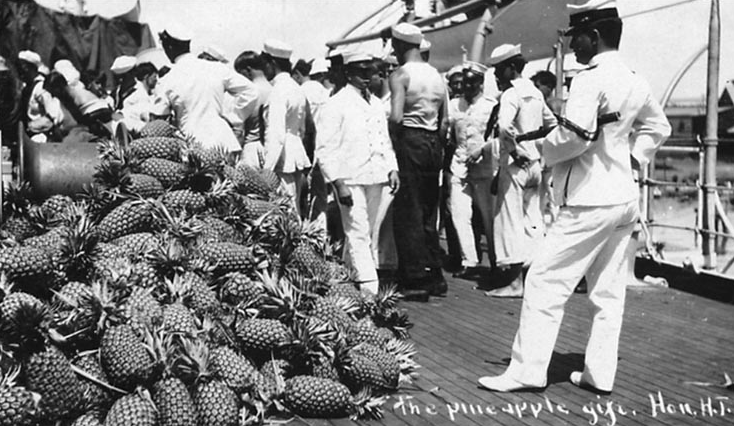 The Great White Fleet pauses in Hawai'i for pineapples. Postcard from 1908 Hawai'i. The first two challenges are pretty straightforward. I haven't done #3 yet, but I'm interested in how you approach the question. As usual, let us know HOW you come to answer these questions. We're curious about how you think about the process, about what works for you, and what doesn't work for you! The next day... How many students? After thinking about this last night, I realized that there was probably a simple solution to the discrepancy... if only I could figure it out. 1986 - Census reports that the US graduated 100,000 doctoral students. 1986 - NSF reports that the US graduated 30,000 doctoral students. That's quite a gap. Clearly, there's something different in the way they're both counting doctors. When I'm stuck on a problem like this, I will consciously try to take a very different look at the problem. This morning I thought "Let's try Google Books!" Maybe the issue is just with the definition of post-graduate degrees. To simplify things, I closed all of my open tabs and spreadsheets and started from scratch. Aside: Because I thought this challenge would be pretty simple, I didn't bother writing down the provenance--that is, where the data came from--because I knew where each dataset had originated. Overnight, though, all that temporary knowledge was lost. It was a dumb move on my part. Note to self: ALWAYS write down where your data comes from! I refound the Census data and the NSF data and for comparison, I found data from the NCES (National Center for Education Statistics). But NOW I had an idea: Was there some way to subtract out some of the non-science-and-engineering disciplines to make the Census data match the NSF data? \5\ Includes Agriculture and natural resources; Architecture and related services; Communication, journalism, and related programs; Communications technologies; Family and consumer sciences/human sciences; Health professions and related programs; Homeland security, law enforcement, and firefighting; Legal professions and studies; Library science; Military technologies and applied sciences; Parks, recreation, leisure, and fitness studies; Precision production; Public administration and social services; Transportation and materials moving; and Not classified by field of study. That matches up (more or less) with what I'd read about in the OECD's report. I poured these three data sets into my spreadsheet in the tab labeled "Postgraduate numbers." Note that I excluded Masters degrees and focused solely on PhDs just to debug this problem. That description above (of \5\ ) is the Other I'd been looking for. If you subtract all of the PhD's labeled as "Other" in the spreadsheet (see column J in my spreadsheet: here I've done the subtraction and then copied these values over into the NCES column on the other tab). Voila! The green dots and line are the adjusted NCES data, subtracting out the "Other" category. Now you can see it: The Census data is a count of ALL the PhD degrees issued in the US in any year... of all flavors and kinds. The NSF data is more-or-less the same as the NCES count of PhDs MINUS all of the PhDs in the "Other" category. There still is a slight variation, but it's close enough that I'll accept these numbers as the full count of all PhDs (the Census data) and the science-and-engineering PhDs (the NSF or adjusted NCES numbers). Bottom line: For 2012, around 47K science or engineering PhDs were awarded in the US. That contrasts with around 170K PhDs for ALL studies combined. Search lesson: There are many here, but I'll just point out three of them. 2. Read the metadata carefully. Learn to love reading all those little footnotes and marginalia. They're often key to understanding the data as a whole. 3. When you create data (or even temporary intermediate data sets) be sure to add in your own metadata. Do NOT let the metadata become separated from the data. 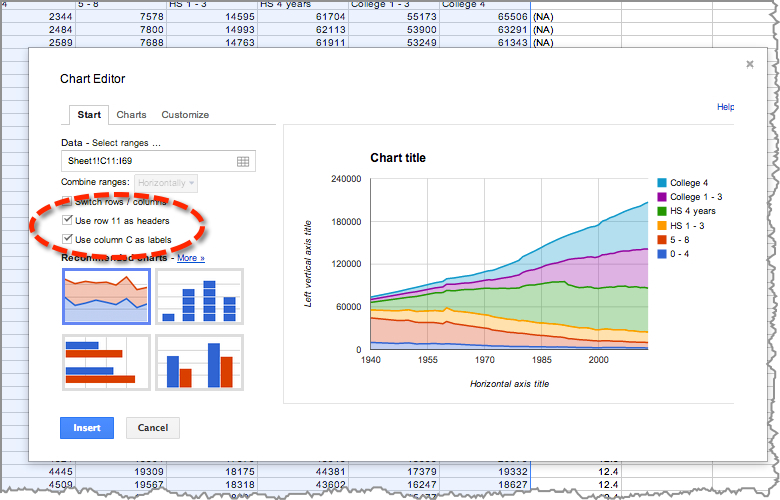 Use the note trick (seen above) to put the metadata into the data tables themselves. If I had done this while making my temporary worksheets, I wouldn't have had to shut everything down and restarted. C'est la vie. Answer: How many students, how many years of school? The challenge here comes in two parts. First, find the data. Second, create a plot of it in the graphical form of choice. The link labeled "Time series data" looked pretty reasonable to me, and when you click through, you see their graphs and links to their data sets. You can see there's a graph (on the left) that's pretty much what I asked for (and it would have been okay to stop there). But I like to get the data for myself, just so I can check what other have done, and possibly re-analyze the data in my own way. In my case, I summarized all of the post-graduate numbers together. 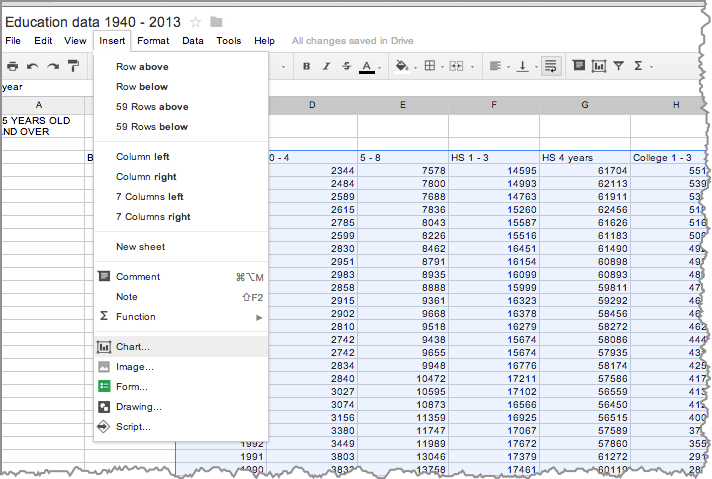 This copies the CSV to my desktop, and then I can create a Google Spreadsheet and import the data into it. I just left all of the defaults about "Import action" and "separator character"to be what they are at the start. The import process usually gets it right, and in this case, you can see a preview on the right hand side. 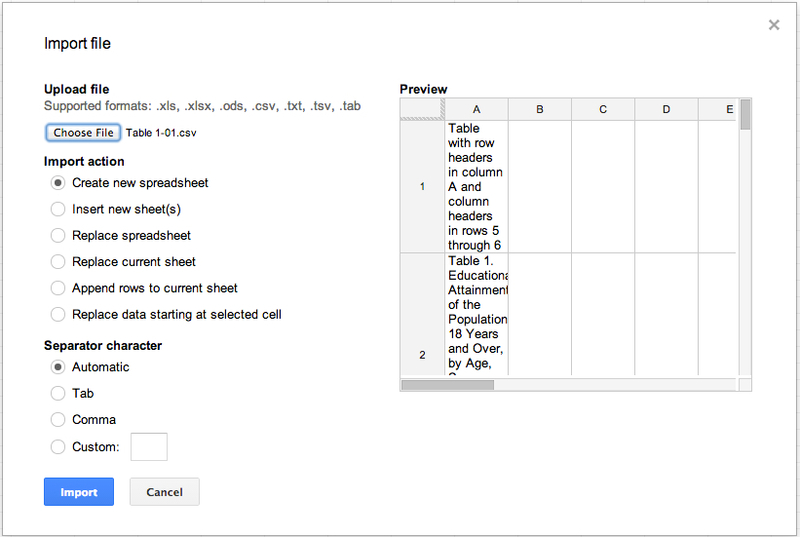 Then, when you click the blue "Import" button, your spreadsheet will look like this. 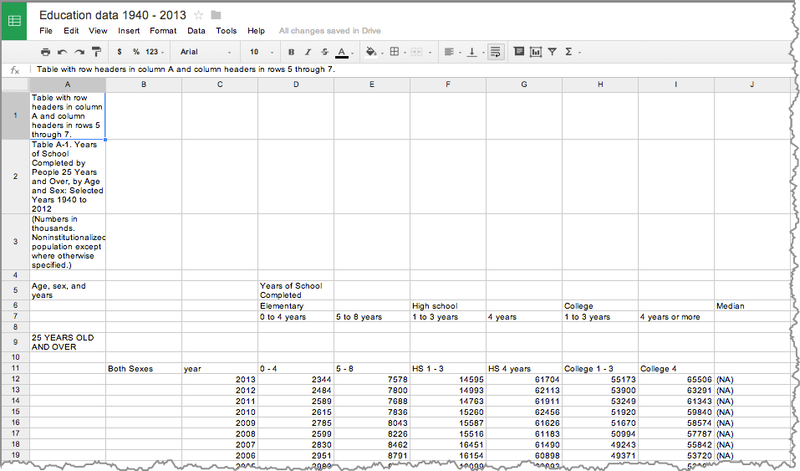 My educational data spreadsheet (if you'd like to look at it). Note that I've highlighted the "Use row 11 as headers" AND the "Use column C as labels" buttons. This is what sets up the chart to plot properly from left to right and create the colors index on the right side of the chart. Then all that's left is to modify the labels, and you've got the chart. Extra credit: Remember that I'd hoped to find the students with post-graduate years of study as well? I was able to find data tables of "degrees granted" by year, but not number in the same format as in the previous data set. 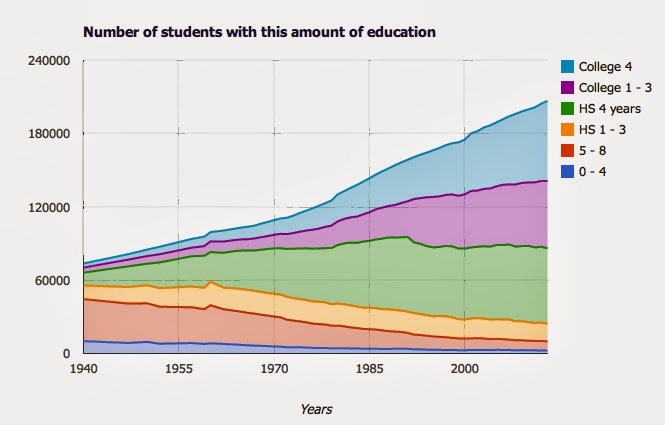 Remember: those numbers in the chart above are the TOTAL number of people, by year, with that level of educational attainment. And here's where I went down an interesting rat-hole. It LOOKS like NSF is underreporting (by a factor of 3) OR that the Census is over-estimating the number of degrees awarded each year. I've read both of these data tables for a while now, and haven't yet figured out why they're so different. The NSF data comes from their survey of graduating PhDs, but they claim a 98% return rate on the surveys. That missing 2% won't make up the difference in the data. 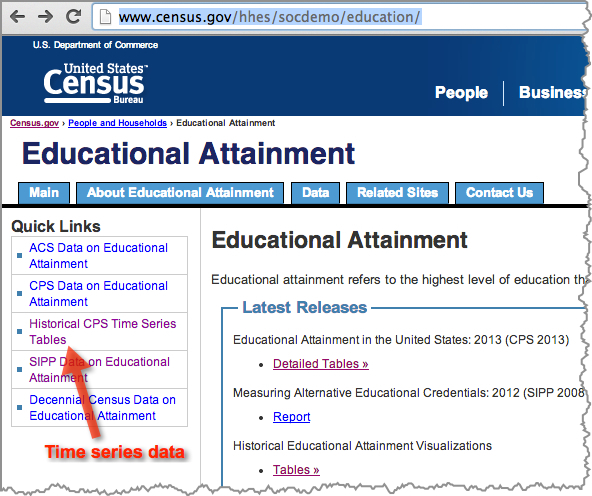 Search lesson: If you want ALL of the data in a time series, search for "time series"--that's the coded language for data collected over time. Perhaps most importantly, be prepared to spend time reading over the metadata (that is, the information about the data set) that describes what the data is and how it was collected. Status: I'll keep working on this over the weekend, but if you figure out why the data is SO different, post a comment. We'll figure this out together! Comment: How many students, how many years of school? You're all doing quite well. Nice work! As many of you have figured out, one of the key phrases here is "educational attainment." As the government defines it: "Educational attainment refers to the highest level of education that an individual has completed. This is distinct from the level of schooling that an individual is attending." In my case, I found their CSV data files, and then was able to use Google Spreadsheets to create the graph I showed yesterday. Wednesday search challenge (2/12/14): How many students, how many years of school? As you know, I'm really interested in education at many levels. I taught graduate level computer science for 12 years, I've taught classes in 4th grade and high school, and I've even taught Googlers and rocket scientists at NASA how to search more effectively. But I always wonder--how well are students doing? A simple measure of that is to figure out how many years of school do students in the US take before they move on to other things? That's the question at the heart of today's challenge. When I thought of this question, it took me about 5 minutes to find the data, download it, and create the following graph. As you can see, this is a stacked graph showing the number of students in the US by year. Each color represents the fraction of students that have achieved N years of completion. As you can see, the purple segment (students who have had 1 - 3 years of college) has always been about the same size as the number of students who have graduated from college. Be sure to tell us HOW you found your data (what searches did you do? what resources did you check out?). If you spent a long time in a rathole, let us know that too. I'll comment tomorrow, then show my answer on Friday and reveal my data source. There's no time pressure to answer this quickly, but I'm curious about how long it takes you to figure out the answer to this. P.S. Don't bother doing a Search-By-Image. I downloaded this data from somewhere and created this graph myself. I hope you'll do the same. Once you have the data like this, you can examine it in many different ways. While I was in Eckley taking pictures of the wreck of the Garden City ferry, I also wandered around a bit in the area that was the former village. Mamie Gonsolves-Perry (ca. 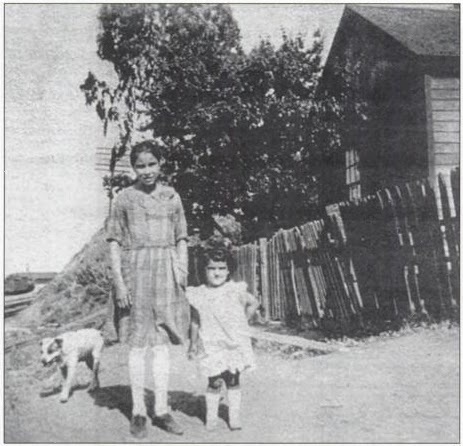 1920) with her cousin, standing in front of their home at Eckley. It's clear that this little area was once both an active brickmaking site (although only one "Eckley brick" structure remains near the pier), and a little village where people actually lived, worked, and played. One of the things that struck me was the occurrence of flowers at the edge of the park. 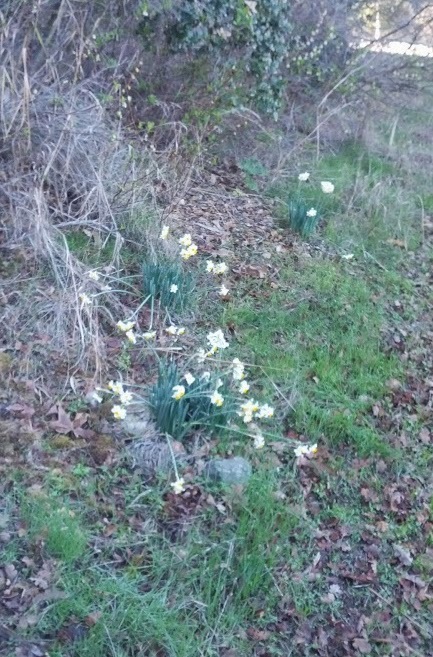 These are jonquils (aka narcissus), and they're not native to this area. They don't migrate easily, so this is the remnant of someone's flower garden. In truth, this is what first caught my attention when I was wandering around at the Eckley pier. These flowers are blooming early (in February!) and are very much out-of-place. And that made me start wondering. What was it like to grow up here? What did this place look like when it was still an active place? The best I could do was to find some aerial images from 1944. This is 20 years after the first photo was taken. One house clearly remains, although the place seems to be mostly parking lot. That house is long gone, of course. I was able to spot a few fragments of what seemed to be foundation, but it's history now. I'm still looking for pictures taken AT (or in) Eckley, the town itself. It's not clear to me that there are any that are online, although I'm willing to bet that the Contra Costa Historical Society has some. I'll try to stop by next time I'm up there. In particular, the CNDC (California Newspaper Digital Collection) has several hits which are pretty interesting. Post Costa, August 15th. — There was another close-call fire in the lower part of Port Costa between twelve and one o'clock last night. At Eckley Station, a tramp set fire to Henry Eckley's barn, which, with some hay, grain and tools was totally destroyed. The fire, unchecked, rapidly spread, burning over five acres of wild oat land. Some fifteen fine large buildings, and a large amount of grain and hay were saved only through the great exertions of the Eckleys and the neighbors. The total loss is $2,500. There was no insurance. 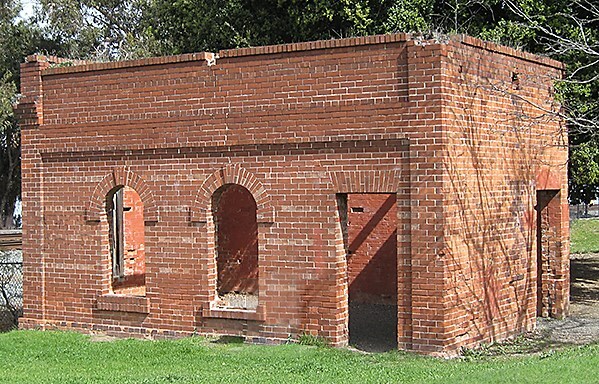 Just two years later, in 13 August, 1885, the Santa Cruz Sentinel reports that another fire destroyed a "hotel and a cottage" in Eckley Station. While in the Daily Alta (Daily Alta California, Volume 81, Number 102, 10 October 1889) we learn in the Personal section of the paper (back then, newspapers would often report personal news, such as who was visiting whom... a kind of detail that we today would find an unacceptable level of disclosure!) that "John L. Eckley, a merchant of Eckley Station, is at the Grand." Meaning, that John Eckley, who lives in Eckley Station, is currently staying at the Grand Hotel in San Francisco. Similarly, just two years earlier (13 July 1887) we see a Personal entry that "John L. Eckley, wealthy rancher, resident at Eckley Station, is stopping at the Grand." I find it interesting that someone visiting from across the Bay, described as a "wealthy rancher" or "a merchant" would be noteworthy. But so it goes. Perhaps because in news reports after this he is referred to as the "founder of Eckley Station." In the 1895 directory John Eckley is listed as having: "office Mission St. Wharf 1, r. Eckley Station" (where "r." means "residence"). Continuing on this this vein (using "Eckley Station" as our key term) leads to all kinds of additional content. Perhaps the most telling is from Google Books, which has back issues of the journal "Clay-Worker." In issue 45 (1906), we learn that the "new Carquinez Brick and Tile company has leased a great tract of land" at Eckley Station, planning to build a new brick plant that can produce 100,000 bricks / day, and employ 75 men. 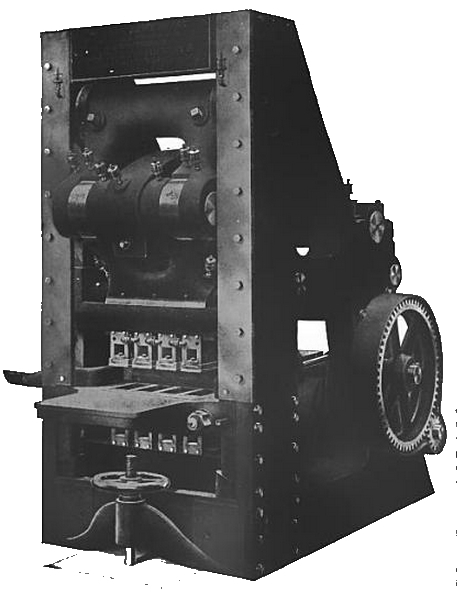 A brick-press machine from 1906 (when Eckley Station would have been making bricks). Search lesson #1: When reading, take note of special formations of the words you seek. Sometimes a particular word pair (such as "Eckley Station") can lead you to MUCH richer results. Search lesson #2: There are multiple Eckleys in the world. In this case, the city in Pennsylvania was intruding into our results. By adding [ CA OR California ] (and later, I added [ -PA -Pennsylvania ] we can improve the focus of the results. Perhaps my favorite find with the [ "Eckley Station" ] query was the following. I'll let you read the story about John Eckley and the amazing swallowed pocketknife. This is from the Daily Gazette (Fort Wayne, IN), 25 November, 1885. Answer: What's that wreck in the water? 2. Can you find a picture of it (whatever it was) taken BEFORE it turned into a ruin? I started by going to Google Maps to get a look-around, just to see what things might be nearby that I could use as search terms. Here's what I saw when I put the lat/long into Maps. But that's a little too far out to be useful. I thought I should zoom in a bit to see more detail. And... what do you know? There's the answer right there on the map! At exactly the place where my "hunk of junk" lay, the map as "Garden City Wreckage" marked. But, as often happens, someone else had already marked this particular spectacular junk pile. I switched to Earth view and zoomed way in to see if it was what I thought it was. 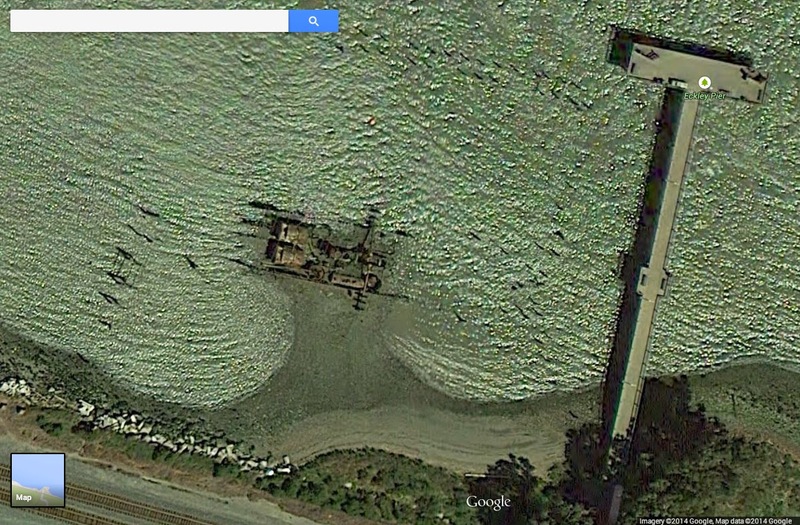 Here's the Earth image (and it's clearly the same, although at low tide). Now that I know it's the "Garden City" (and probably a boat of some kind), I had to figure out the story. returns a large number of hits, all of which tell the story of how the Garden City was built in 1879 as a sidewheel ferry for the South Pacific Coast Railroad to move train cars to San Francisco. Although the Garden City was built with narrow-gauge track on the main deck to carry freight cars to San Francisco, but could also carry passengers and cars as a relief ferry. Southern Pacific used Garden City as a relief boat for their auto ferry run on the old "creek route". Garden City stayed on the "creek route" as a passenger ferry when auto ferry service was shifted to the Oakland pier. 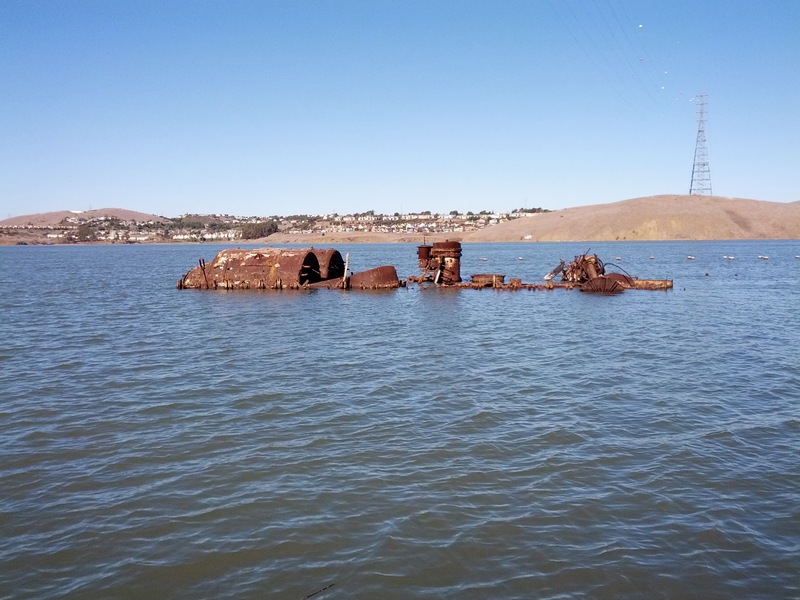 The ferry ran from Alameda to San Francisco until 1929 when it was brought to the piers at the town of Eckley as a fishing resort. Unfortunately, that was its last assignment before becoming a picturesque wreck. If you search in Images, there are quite a few images out there. Here's a link to one from Dory Adams' web site showing the ferry before it became a wreck. Garden City Ferry, 1980. Linked image from Dory Adams site, taken by Kevin Scanlon. And another image of the Garden City steaming into the Ferry Building at the Embarcadero in San Francisco (c. 1904). 3. Can you find a newspaper article about how this wreck came to be? Now it's time to turn to my trusty Newspaper Archives. So I visit News.Google.com/newspapers and redo my query there. This leads to several articles in the news archives, all saying more or less the same thing. 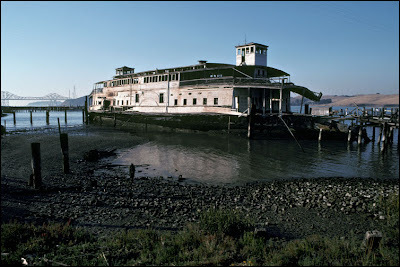 Fires, started by arsonists, destroyed large parts of the area, and spread onto the old wooden ferry, burning it to the waterline next to the Eckley pier on Sunday, August 7, 1983. Another excellent book is Port Costa which also tells the history of "Garden City" with many images over the years, and with a detail saying that it was the "largest dance floor in Contra Costa county" in its day. There's also a Christmas card from its time as fishing resort. and find The Contra Costa Historical Society . Their site is a little funky, but by navigating down (search doesn't seem to work very well), I was able to find all of the photos shown in the previous pages, and get confirmation from a different (and very local source). 1. Zooming in on a map can sometimes reveal information you can't see at all levels. In this case, it basically gave me the answer instantly, but you have to know to zoom all the way in (and check each level--most easily done by using the + and - controls). 3. 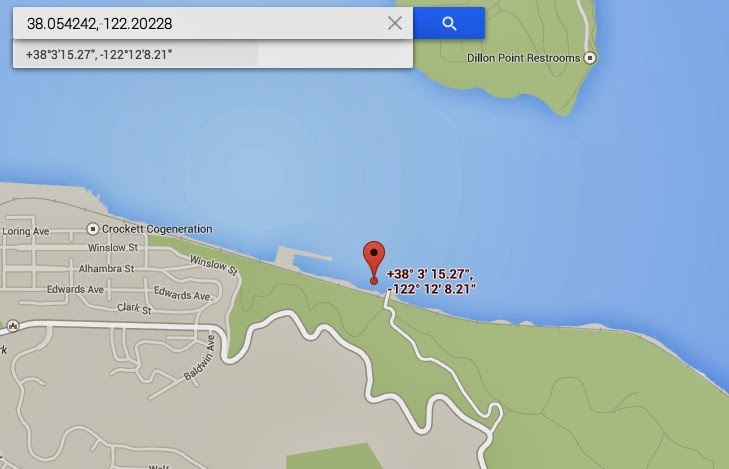 Using local place names can help focus the search and find new information. 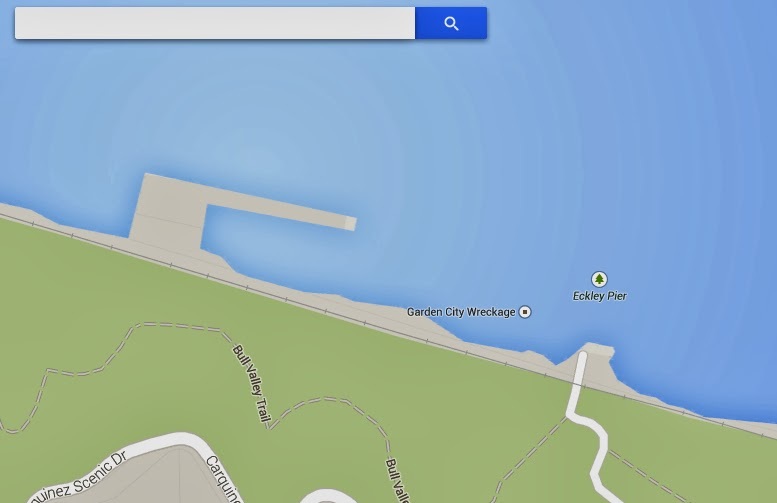 In this case, Eckley is name of the pier, but it WAS the name of the village where the Garden City was finally moored. Likewise, Port Costa is the closest "big" town (nowadays, it's around 200 people), but it's a longer lasting place that Eckley, which no longer has any town left. BOTH place names, though, help to find news articles and books with local information. 4. Local historical societies and libraries often have great local historical information. Here, I used the "look for a county historical society" trick to locate a nearby cache of historical photos. Keep that in mind when you're searching for this kind of information. Here's an article that indicates his father turned in his son for the crime after admitting he was responsible. That's a difficult thing for any father to admit, perhaps especially one who is the local fire chief.